Masaccio rejected the artistic conventions of grace and idealized beauty for sacred subjects in favor of representations that were, in the words of Vasari, “lifelike, true, and natural.” He wanted to make the Christian faith more tangible and accessible to the common person. Like many Renaissance artists, he painted grand human dramas that emphasized the dignity of humankind. His skillful use of simple forms, colorful figures with emphatic gestures and expressive faces, three-dimensional perspective, and shadows made his subjects seem almost palpable. In his famous fresco depicting the Trinity in Santa Maria Novella in Florence, Masaccio employed many of these techniques to portray the central mystery of the Christian faith—the one God who is three persons. Though Masaccio's rough, natural style went against prevailing tastes in his time, he had an enormous influence on later Renaissance artists such as Michelangelo, Leonardo, and Raphael. Not a shabby legacy for someone who died before his 28th birthday. There is perhaps no Renaissance artist whose art so closely reflects his personal character as the painter known to us as Fra Angelico. Described as “simple and most holy,” “humane and temperate, living chastely,” he claimed “that anyone who created works involving Christ ought always to reside with Christ.” Vasari tells us that “although he could have lived most comfortably in the secular world … and could have earned whatever he wanted from the arts … he nevertheless desired, for his own satisfaction and tranquility (being by nature calm and gentle) and, principally, for the salvation of his soul, to join the Order of the Preaching Friars,” that is, the Dominicans. In 1449 he was elected prior of the Monastery of San Marco in Florence, which he had decorated with frescoes in service of the Order some years earlier. From early on, recognition of his moral character and devotional piety rivaled his reputation as a painter. He even turned down an invitation by the pope to be archbishop of Florence, claiming that he did not feel well suited to such a leadership position. Long before his death, he was referred to simply as Fra Angelico, the Angelic Brother. Fra Angelico saw his painting as a devotional exercise. It was said that he “never set his hand to a brush without first saying a prayer. He never painted a crucifix without the tears streaming down his cheeks.” But more importantly, he also saw his paintings as being far more than mere representations of sacred subjects. Their primary purpose, to borrow the words of the 15th-century architect and art theorist Leon Battista Alberti, was “to move the soul of the beholder.” Renaissance Christians viewed religious images not only as a valuable means of teaching biblical stories and doctrines (as advocated by Pope Gregory the Great in the sixth century), but as having a spiritually transformative power. Fra Angelico's many paintings of the Annunciation to Mary bear witness to his deep interest in the mystery of the Incarnation. He clearly follows the teaching of Saint Antoninus, archbishop of Florence, who wrote that in submitting to God's mysterious plan Mary models perfectly the attitude that a monk or believer should have: “piety is … expecting blessedness and the coming of the great divine glory.” So too, concludes Antoninus, the Word may be incarnated in the believer so that the “light of devotion” will radiate within him. Several of Angelico's Annunciation scenes depict the expulsion of Adam and Eve from Eden in the background of the main scene, clearly relating the coming of Christ to its cause—the need to redeem humankind. As Antoninus also taught, “death will be destroyed by death and birth repaired by birth.” Like many scenes of the Annunciation during the Renaissance, a column visually separates Mary from Gabriel, standing in for Christ. It reminds us that by becoming a man, Christ bridged the great divide between God and humanity. The column also foreshadows his suffering when he was bound to a column (according to tradition) and whipped before embarking on the path to Gethsemane. In the time of Lorenzo de' Medici, … truly a golden age for men of talent, there flourished an artist named Alessandro, shortened to Sandro according to our custom, with the second name of Botticelli," begins Vasari's Life of Sandro Botticelli. In contrast with the monumental human dramas of Masaccio and Michelangelo, Botticelli represents a poetic current in Renaissance art that appealed especially to the wealthy ruling elites of the time. He had a distinctive painting style characterized by a strong decorative appeal, learned from his apprentice days in a goldsmith's shop and as an assistant to the painter Fra Filippo Lippi. The tapestry-like Primavera (Spring) and The Birth of Venus, perhaps his two most popular and widely reproduced paintings, reflect the concern for reconciling classical philosophy with Christian theology among the humanists who dominated the court of Lorenzo de' Medici. For instance, the chaste, robed goddess Venus at the center of Primavera could just as easily be interpreted as Mary, the mother of Jesus, both of whom were seen as symbols of love and societal nurture in the Renaissance. Intelligent and genial, Botticelli could move equally well among the most erudite court circles or the young apprentices in his workshop. He had a reputation as a prankster who loved nothing better than to play practical jokes on his friends and assistants. This makes the question of his response to the charismatic Dominican reformer Savonarola all the more intriguing. Savonarola's fiery preaching called for the cleansing and renewal of both the church and Florentine society and drew followers from all walks of life, including one of Botticelli's brothers. Botticelli himself has been identified as one of Savonarola's piagnoni (“weepers” or “snivelers” as they were derisively called by opponents) in some sources. According to one story, the painter was so affected by Savonarola's preaching that he burned many of his “worldly” paintings and turned more toward religious subjects. Some have assumed, therefore, that he was an ardent follower of Savonarola who had experienced a profound conversion. No person exemplifies the concept of the “Renaissance Man” better than Leonardo. Music, drawing, painting, sculpture, architecture, town planning, optics, and aviation; hydraulic, military, structural, and mechanical engineering; anatomy, biology, zoology, botany, geology, geography, astronomy, and mathematics—the list of his interests and areas of endeavor goes on and on. In an age of high achievements and even higher aspirations, Leonardo stood apart, in a class by himself. But there was a cost to Leonardo's genius. His prodigious talent and restless mind kept him from focusing his energy on any one thing for very long. His perfectionism caused him to seldom see a project as done, frequently frustrating his patrons with his endless tinkering. “Impatience, the mother of stupidity, praises brevity,” he claimed. His experimentation with new materials and techniques frequently had disastrous results. The paint from one mural literally slid down the wall as it was being painted, and the Last Supper began to show almost immediate decay for reasons that still remain something of a puzzle. For a man whose completed works can be counted on two hands, it is remarkable that he is first and foremost remembered as an artist. In spite of all of the ink that has been spilled in an effort to explain him, he continues to intrigue and confound understanding. Idiosyncrasies like his practice of employing mirror writing (writing backwards from right to left) for his notes have given rise to wild speculations about the reason for his desired “secrecy” and, for the credulous, make all kinds of unfounded charges seem plausible. In his reverence for the wonders of nature, Leonardo acknowledged the signs of a higher power. An agnostic at most, he nevertheless created moving and theologically profound images that reflect a deep understanding of the Christian faith. Some of those images have stamped an indelible impression on the Christian tradition, shaping the way we think about certain subjects and biblical events today. In a society that was essentially Christian, as Renaissance Italy was, it should not be surprising to find a man such as Leonardo who could accurately represent convictions he did not personally hold. Despite his lack of belief, Leonardo had a great appreciation for Christianity's grasp of the human condition and many of the values it advocated. In the Last Supper, Leonardo assembles a remarkable cast of characters caught at the moment when Jesus announces that one of them will betray him, a moment pregnant with meaning. The words seem to ripple through the company like a wave, with each man reacting in his own fashion. Christ, the stable center, is framed by the light of a doorway directly behind, clearly designating him as the Way, the Truth, and the Life. Leonardo wrote that “to make perfect works of art, painters had to take their inspiration only from nature”—something he claimed to have learned from Masaccio. In order to make the Last Supper “real,” he combed the streets looking for models for the simple fishermen who were Jesus' disciples. He walked the rough neighborhoods of Milan at night in search of the criminal element to find his Judas. But he struggled to identify a model for Jesus, finding no one with the qualities necessary to represent Christ, the God/Man. Yet somehow Leonardo managed to imbue that figure with a grace and transcendent mystery that seems to make one want to know him. That is the genius of Leonardo. Soon after Raphael's death at the age of 37 on Good Friday in 1520, the earth shook. It was said that heaven was repeating one of the cosmic signs that had occurred at the death of Christ—a poignant epitaph for the man who would be known as the “divine” Raphael. Above his bier in the Pantheon was placed the unfinished painting of the Transfiguration of Christ, which Raphael had been working on right before he died. Infused with a mystical power not seen in his work before, this painting has inspired speculation that Raphael may have been associated with the Oratory of Divine Love, a lay organization that promoted reform of the church through common prayer and fellowship, regular communion, and acts of charity. 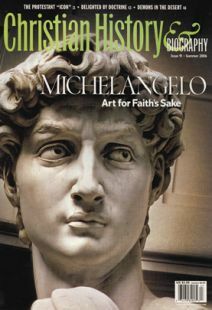 Although little is actually known about Raphael's personal faith, he was frequently described as a pious man with an easy temperament that accounts for his success as much as his ability. His one weakness appears to have been women, which proved to be a distraction from his work from time to time. Like other Renaissance artists, Raphael was a man of many talents—in painting, sculpture, and even architecture. The son of an undistinguished court painter, he produced many beautiful paintings of the Madonna and Child in his early career. During a short stay in Florence, he was deeply affected by the work of Leonardo and Michelangelo. In Rome, he became a favorite artist of Pope Julius II and of his successor Leo X. His work exemplified the vision of an ennobled humanity made in the image of God and the dignity, order, and stability to which the Renaissance aspired. Raphael's first project in Rome was the decoration of the Stanza della Segnatura, a room probably intended by Pope Julius II as his personal library in the papal apartments of the Vatican. Each of the walls is dedicated to one of the four paths to human wisdom: Theology (Revealed Truth), Philosophy (Rational Truth), Poetry (Beauty), and Law (Virtue or the Good). Set within a monumental architectural hall, Philosophy (the so-called School of Athens) depicts a host of ancient philosophers with their students, discussing various issues. At the center, framed by an arch, walk Plato and Aristotle. Plato points to the heavens indicating his focus on the ideal, while Aristotle points down to the earth indicating his commitment to the observation of reality. The vigorous debates pictured in these murals effectively dispel any notion that argument was discouraged or feared by the church. Raphael was working on these murals at the same time that Michelangelo was painting the Sistine Chapel ceiling. According to a widespread legend, Raphael sneaked into the chapel one night to take a look at Michelangelo's work and was so overwhelmed by what he saw that he inserted the figure of a brooding Michelangelo at the front center of the School of Athens as an homage to the great artist. Although it is more likely that Raphael saw the ceiling when it was opened to the public, his own work was never the same. Dramatic action and dynamic figures learned from the Sistine Chapel ceiling frescoes, combined with a growing capacity to capture the personality of his subjects, make his later works even more compelling. Had his life not been cut short, his legacy would have rivaled that of Michelangelo. Rachel Smith is the Gilkison professor of art history at Taylor University in Upland, Indiana.